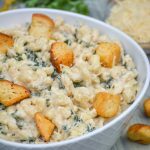 A rich & creamy white cheddar macaroni and cheese is infused with Caesar dressing and a healthy amount of perfectly cooked kale. To a large skillet, add the pasta and half & half. Bring the mixture to a boil over medium heat, stirring occasionally to prevent sticking & clumping. Lower the heat, and let the pasta simmer for 4-5 minutes continuing to stir occasionally until the mixture's thickened. Add the kale, stirring to evenly incorporate, and let the mixture cook another two minutes until the kale's wilted. Lower the heat to low, and stir in the cheeses. Stir until the cheeses are all melted and equally incorporated. Season the smooth cheese sauce with salt and pepper, to taste. Stir in the dressing, remove the pasta from heat, and ladle into bowls. Top each bowl with Parmesan cheese and a couple croutons. Enjoy!